Previously, in this announcement, we mentioned Unlimited Plans for hosting that we offer at our subsidiary site, Tierra Host. Today we would like to tell you about another great offer that Tierra Host is offering . . . If you purchase a cloud based shared hosting plan, you can choose from 15 different TLD (domain) extensions and register it free for one year. After that first year you still get a great deal as the renewal price is lower than most people offer the same domains for at regular price! 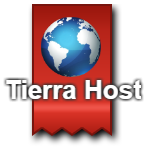 For more information, visit the cheap domain names registration page at Tierra Host.